Summit Christian Academy (SCA) is pleased to recognize students who consistently exhibit exceptional Christian character. The purpose of this award is to encourage students to pursue their potential toward attaining the highest level of personal and academic development. 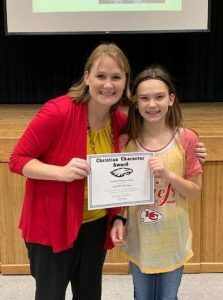 The elementary school’s Christian Character Award recipients for the second quarter are third grade student Isabella Skinner, daughter of Jeremy and Angela Skinner, and fifth grade student Kai Haulotte, son of Kyle and Lindy Haulotte. SCA third grade student Isabella Skinner, pictured with SCA Elementary Principal Charissa Sanders, received an elementary Christian Character Award for second quarter. 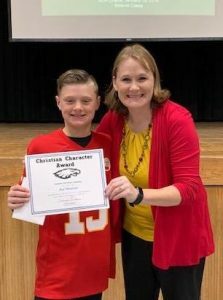 SCA fifth grade student Kai Haulotte, pictured with SCA Elementary Principal Charissa Sanders, received an elementary Christian Character Award for second quarter.